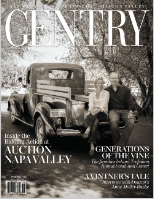 "The world's most trusted authority on delciousness"
Gentry Magazine is a Bay Area-focused lifestyle magazine. It's annual wine issue is one of the few publications distributed at the Auction Napa Valley event. Histoire d'Amour: Profile on Julian and Elan Fayard, the winemaking couple behind Covert Estate, one of Napa's newest and most talked about wineries. Generations of Magnitude: Recovering from the devastation of the Napa Valley earthquake in 2014, brother and sister Loren and Hailey Trefethen seek not ony to uphold the legacy of their parents and grandparents, but to build an exciting new future for their award-winning Trefethen Family Vineyards. Monthly contributor (food column and feature articles) for Climate Magazine, a Bay Area-focused lifestyle magazine.